PROPRINT is a multi-platform software solution that enables management and monitoring printing via user card identification. This multi-platform software solution enables monitoring printing volume, warning us on the run out of toner in order to make a timely replacement, follow-me printing (the copy comes out of the printer, where you are authorized), protected printing with "Find Me" functionality, internet printing without the need for drivers and the ability of automatic routing print based on rules set by the system administrator. 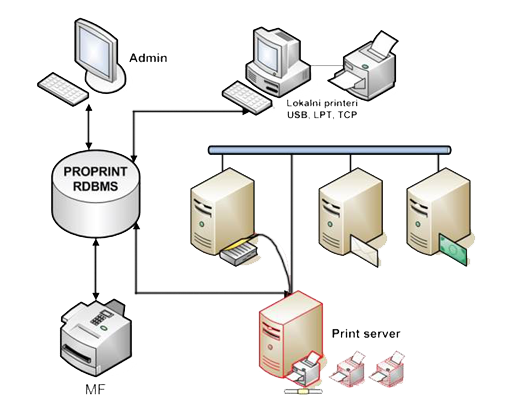 In addition to installing the print server, PROPRINT software can be installed directly on the multifunction (MFP) device that allows easy printing, scanning, faxing and copying directly from the MFP. PROPRINT takes care about forests. We control our printing which leads to lowering paper usage and saving forests. Saving paper increases efficiency and increases productivity levels throughout an organization. We are set up and ready to provide clients with highly qualitative printed communication products and competitive pricing. Let’s get started with PROPRINT today! Prices of licenses Call us! Call us! Call us! Call us! Call us! Call us! The user receives a fully operational hardware solution for printing, fully customized for customers needs. Based on a detailed analysis of the situation, the customer gets designed hardware infrastructure with all equipment that follows. In this package, in addition to standard printing, customer has the ability to print in color. This amendment represents a completely modern approach to the press, where the client easily and expeditiously primarily through special personalized ID card manages processes and content that wants to print. The client receives complete hardware structure built to suit clients needs. The system monitors of contemporary software, which records all the valid information in the system. In this way it is easier to follow orders, documents that have passed through the printing system, as well as monitoring of all stakeholders in an organization.Software facilitates and accelerates the realization of all the processes of scanning, copying and printing. This license package constitutes a total solution package for printing, copying and scanning.